In the new WaveEngine 2.4.0, the model load process has been improved, so there are some important changes that you should know when working with models. The following components are deprecated. You will able to use them in WaveEngine 2.4.0 by retro-compatibility but they will be removed in a future release. 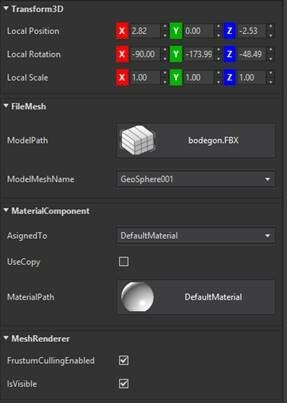 FileMesh: This component replaces the Model component and allows loading of a single mesh inside a model. MeshRenderer: This component replaces ModelRenderer drawable3D. MaterialComponent: This component replaces MaterialsMap component. It is marked as “AllowMultipleInstances” so you can add multiple MaterialComponent instances to an entity.